While recently touring in North County Cork about 6km from Mallow, we happened upon a country mansion of particular charm and elegance. It was time for morning coffee and scones (hopefully), so what better surroundings we thought to complement that ritual, than the grandeur of a country manor house. Venturing from the main road into the Longueville Demesne we journeyed, via a rough surface driveway of about 1 km, past two interesting lodges, and eventually arrive at the main dwelling; the magnificent 18th Century Mansion: Loungeville House. After parking the car in the nearby car park and making our way back the short distance to the front of the house, we were awe struck by the magnificent view way off into the distance towards Dromineen Castle (The original seat of the O’Callaghan Clan). We entered the dwelling via its massive hall door and found our way into what could only be described as a sumptuously large 18th Century sitting room tastefully bedecked with furnishings of that period. What luxury. We located a member of staff who took our order and in a short while we were pouring tea from an elegant teapot through silver tea strainers and applying layers of jam and cream to our scones. Ah, that was the life for sure. However, with each bite of my scone I found myself thinking what would life have been like for previous owners and occupiers of this beautiful house? “Longueville is situated on an eminence overlooking the Blackwater Valley – the Irish Rhine. The house, a Georgian Mansion home, is in the centre of a 500 acre wooded estate. The beautifully sited house, or centre block of same, was built about 1720 by the Longfield family who always maintained they were of French extraction and not Cromwellians. The first Longfield appearing in the history of the area was a tax collector. How he acquired the property from Purdon, a soldier of Cromwell, is not certain, but it is certain that these lands were originally owned by Donough O’Callaghan who fought with the Catholic Confederates after the collapse of the 1641 Rebellion and so O’Callaghan forfeited his lands to Cromwell, the property held by Clann Ua Ceallachain for as far back as history can go for us – “lands as beautiful and fertile as any in Ireland”. At this time the area was known by its old Gaelic name Garamaconey, but the Longfield family (probably when Richard Longfield was created Baron Loungeville in 1795) changed the name to Loungeville. This same gentleman was rewarded with a Viscountcy five years later for his support of the Act of Union, together probably, with a large sum of money which he may have got as compensation for loss of his seat in Parliament. It is a fair assumption that this money was one reason anyway for the expensive re-construction and alterations carried out to the house at this time. Dated from this period are the two spacious wings added to the house together with the stone parapets and the pillared porch. The house, which is architecturally descriptive of the late Georgian period, features a large hall door and fan light, Portland stone floored entrance hall and two beautifully plastered and decorated ceilings in the dining room and main lounge completed by an Italian Artist. There is the white marble Adam mantelpiece in the dining room featuring a relief depicting Neptune in his Chariot. There are numerous inlaid mahogany doors with magnificent brass locks. There is also the very fine Victorian conservatory constructed in curved ironwork which was added to the east side of the dwelling in 1866. Loungeville as it stands today encapsulates the splendour of antiquity and is back once again in the ownership of the O’Callaghan’s whose forbearers were originally deprived of the property by Cromwell in 1650. The wheel turned a full circle when the present owner’s grandfather, Senator William O’Callaghan, bought the property in 1938. Should you be touring in the area then this lovely Demesne and Manor House is well worth a visit, especially if your family name happens to be O’Callaghan. I was interested to note the link between the tree planting arrangement at Loungeville Demesne and the battle lines at Waterloo. Upon hearing this I was immediately reminded of another and yet stronger link to the Battle of Waterloo which is the grand monument to the Duke of Wellington in Dublin’s Phoenix Park. 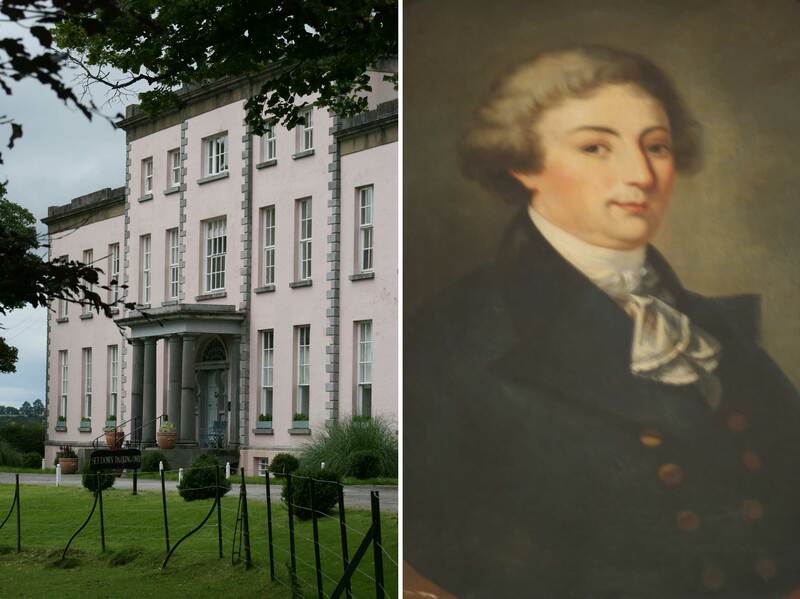 Have you seen Loungeville Demesne? What was your impression? Did you find this post interesting/entertaining? If so please click the Like button at the bottom of the page. Thank you. This entry was posted in Architecture, Family History, Food, Leisure, Military History, Nature, Nature Walks & Trails, Places, Social History, Travel and tagged 1641, 1720, 1795, 1866, 18th century, 1938, act of union, adam, alterations, architecture, artist, baron, battle, blackwater, castle, catholic, ceallachain, ceilings, chariot, clan, clann, collector, compensation, confederates, conservatory, cork, cream, cromwell, demesne, donough, doors, dover, dromineen, east, fan light, fertile, french, gaelic, garamaconey, georgian, hall, hostess, house, inlaid, irish, ironwork, italian, jam, lodge, longfield, loss, loungeville, mahogony, mallow, manor, mansion, mantlepiece, marble, neptune, o'callaghan, oak, parapetspillared, park, parliament, phoenix, plastered, porch, portland, property, purdon, re-construction, rebellion, richard, scones, seat, senator, soldier, stone, tax, tea, trees, ua, valley, vicount, view, waterloo, wheel, white, william, wings. Bookmark the permalink.